Buy Big or Buy Small: Does Pot Size and Quantity Matter with Tomatoes? “My friend and I don’t agree with how we buy our plants. My friend buys all her tomatoes and peppers in little packs of 3, 4, or 6. They look so skinny and sickly. I always buy mine in single pots because they are bigger and better and blooming. She tells me I am nuts to spend so much money on the same thing as her. I know my plants will grow better. What do you think? I plan to show her your response, so make it good! Thanks for your questions. Sorry to burst your bubble, but bigger isn’t always better. 1. Appeal to the customer’s eyes by having them think that big plant with flowers will produce fruit soon. 2. Appeal to the customer’s brain by making them think that the plant will be healthier and better because the single potted plants are always darker green and have such a sturdy stem. 3. Appeal to the customer’s wallet because things that are more expensive are better quality. 1. 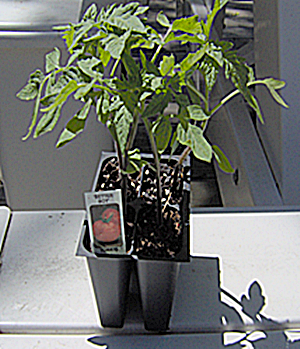 Days to Maturity: If you have ever looked at a packet of tomato seeds or the plant stake that is included in a pot when you buy the tomato plant at the greenhouse, you will see that it has “– days after transplant”. With tomatoes and other plants that require a boost indoors before being planted outside, the days to maturity is based on the days after transplanting. It doesn’t matter if your plant if 4 inches tall with 6 leaves or 12 inches tall with 16 leaves: it will still take the same amount of days after transplanting to have fruits. 2. Transplant shock: Transplant shock occurs to every plant when it is taken from one place and put in another. It doesn’t matter if you have a large root mass or a small one — all movement is shocking to the plant. The larger the plant is, the more shock it will have and the longer it will take to recover from the shock because it is an older plant. (For those in the northern states, most greenhouses start single potted vegetables 4-8 weeks earlier than those in multipacks). So while your large tomato plant is recovering from the rude awakening of being put into your garden, your friend’s little tomatoes will quickly recover and soon be as large (if not larger) than yours and yours will still be recovering and not growing. In general, the best size plant for transplanting is one that is 4-8″ tall. Any larger than that and you are setting yourself up for a lot of shock. 3. Flowers don’t mean fruit: Just because a tomato is flowering when you buy it doesn’t mean those flowers will have fruit. Flowering is often a sign that a plant is in shock. It’s like the plant is saying, “oh no, things are not right in my current environment, I need to flower and produce fruit because I may soon die.” Flowering tomato or pepper plants in a greenhouse indicate that your plant has been growing for a long time (probably since February or earlier) and is more than ready to be producing fruit. However, the little pot that it is growing in is a much smaller amount of soil than the plant requires to make fruit. The flowers will usually drop without producing fruit or the fruits that are produced will be small and of low quality. Also, if you plant your transplants soon after purchasing them and leave the flowers on, they will produce fruits, but the plant will focus on producing those fruits only rather than growing larger and making more fruits. It is always best to pinch off all buds and blooms on vegetable plants when they are transplanted into the soil. 5. Expense: The truth is, seeds are cheap. Insanely cheap. On average, an open pollinated or heirloom variety will cost about $0.001-0.005/per seed (that’s right, tenths of a cent). Hybrids usually cost $0.005-0.05/per seed. While there is an addition cost of fertilizer, water, etc., it doesn’t come close to adding up to the premium price of the single potted plants. And, as a person that used to work in the greenhouse industry, the greenhouse owner is chuckling over the people that buy ‘premium’ plants all the way to the bank. So, Janelle, unfortunately for you, your friend has it right. Don’t believe me? Research done by the Samuel Roberts Foundation, Iowa State, and UC Cooperative Extension backs me up on this. I hope this information helps you out and that you make a wiser decision in the future. If you have any other questions, please feel free to ask.